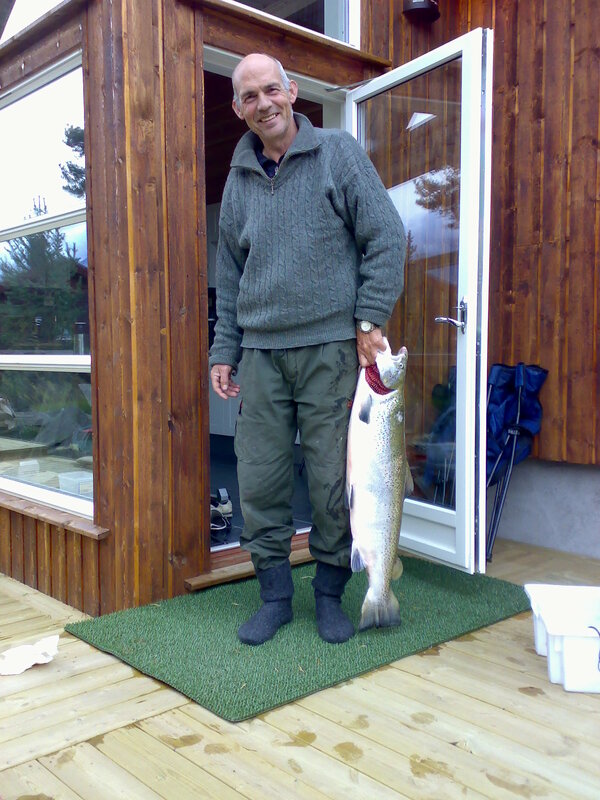 Inventor of Kvalvik Bait writes about the largest trout he had caught. Spring is the peak season for sea trout fishing, and the ravenous torpedoes called “silver of the sea” are everywhere along our long coastline. Generally trout is located in reasonable proximity to the river it has grown up on, and rarely more than 30-40km away from it since it becomes more difficult to go upstream in order to spawn. As a basis for good trout fishing spots in the sea, one could look for rivers where one knows that trout is found. During its stay in the lake, trout uses the time to feed before it goes up the river in summer or autumn. They often seek out areas that are rich with food they enjoy, for example, marflo and polychaetes. Typically, in areas that are known as “leopard bottom”, where its mixture of sand and seaweed make for excellent nursery habitats for both marflo and polychaetes. When it’s cold in the water in winter and in spring, sea trout seeks brackish areas with low salinity of the water, which they may find near small rivers and streams that flow into the sea. If, there are some powerful currents in the range, the better. For example, around the small headland jutting out into a shallow bay, you can be pretty sure that the area offers trout. The best time for fishing only begins in late April and lasts until June. This is somewhat later than in Southern latitudes since water temperature rises later in the North. Thus, the first real trade in fish happens only after Easter. Just be mindful of current fishing rules in Norway, including that which states that you’re not allowed to fish closer than 100 meters to the river mouth. A stroll along the seafront on a mild spring day is always a worthwhile endeavor. Add a fishing rod and a bunch of good lures, and that’s all it takes to give the trip both meaning and excitement. And with a bit of luck, you might even be able to ensure dinner. For boat afficionados – the possibilities are even greater when you’re trolling along the coastline around the same locations that other recreational fishermen use. Alternatively, you can also head further out – in the strait between islands, reefs, with the current flows or in popular lakes. Trout fishing is something anyone can try and manage with a simple selection of lures. How exciting it is when the trout takes the bait and races out with some meters of line as the reel screams! It is a dextrous sport! The sea trout is a voracious predator that is always looking for food. And generally speaking, trout is found where there’s ample hiding space and food – which are two of its most basic needs. This combination of the temperature of the water and abundant food supply make April the month in which trout are easiest to catch on the fjords. In the spring, the fish goes into the shallows to find food, while spawning fish head for the rivers. As temperatures increase, the fish become more and more attentive. A handful of sea trout flies as tied by Oliver Lauknes from Andresen Våpenforretning in Tromsø. Sea trout are omnivorous. Small fishes, various shellfish and clams, crabs, sand shrimps, bristle worms and feather worms are popular with them. The fisherman should thus mimic the sea trout’s natural appetite. Likewise, if you use Kvalvik Bait in combination with traditional fishing methods, you have increased chances to catch trout. One can fish with whatever they have at hand, but elongated, shiny lures are good starting points. 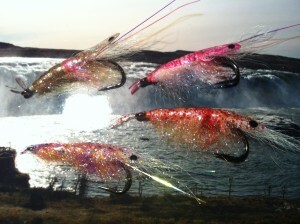 Early in the year when the water is cold, transparent lures in combination with blue, green or white often works best. Relatively small hatches are preferred (5 to 15 grams) and a collection of spoons, herring lures , spinners and wobblers in polished copper or blue , red, black or green should be at hand. The darker it is in the water, the darker the lure you should be using. Most equipment is good enough for trout fishing. But you’ll have the most fun with a relatively long and sensitive fishing rod. 12 feet in length and with casting weights from 5 to 20 grams would last you for some time. It is quite common to catch trout between a pound and a half kilos, but this depends largely on their size of course. Using “sluk” lures is the most common way to fish for trout, but many make an attempt with a fly rod or spinning rods and trout bombs with a leader distance of about 3m. It is also effective to fish trout with bait. Wagglers loaded with shrimp, herring or pieces of mackerel fillets tend to work. But it’s also smart to dig up worms and polychaetes at the beach during low tide and use this as bait. Many wade across beaches and shallow areas when fishing for trout. But the key is to move quietly into the water to avoid scaring the fish. The same applies when you’re on land, so be sure to tread quietly the last few meters to your fishing spot. The is also a big difference days. 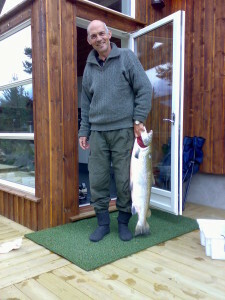 Some days it is easier to bet on getting a sea trout, others not. If the fish are not biting, or even more annoyingly , when it follows the spinner , but turns away just before it is at your feet, it might be a tricky to stop and hold back the reel. Once it gets dark in autumn, this is the time to start fishing for trout in most rivers and you can do so by using mainly lures and flies. In fact, fishing methods are generally the same as for salmon.